Scrimshaw is the art of drawing and inking pictures and designs onto the bones, teeth and tusks of marine animals, including whales and walruses. 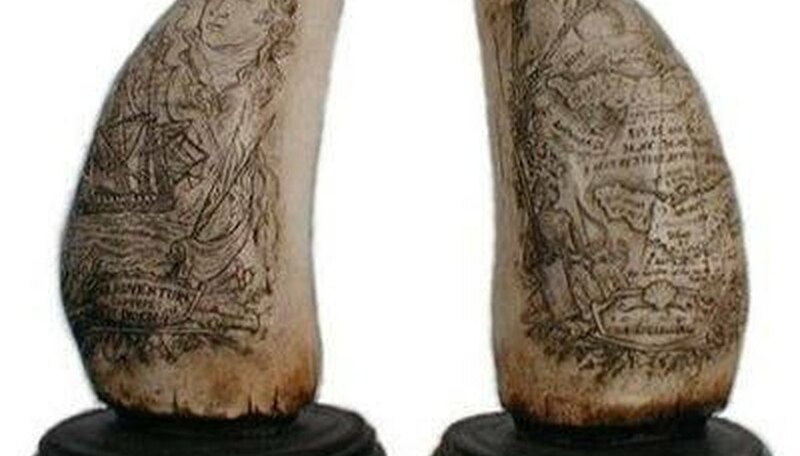 Scrimshaw developed among whalers on their long voyages hunting whales in the eighteenth and nineteenth centuries. Today, whale hunting is outlawed in most countries, but scrimshaw artists---known as scrimshanders---continue to produce art on elk ivory (from elk teeth), hippo teeth and other legally traded kinds of ivory, such as mammoth ivory. Many artists also work with nut palm (also called tagua nut), antlers and bone, including camel bone. While scenes of whaling, such as whaling ships and hunts, is traditional, today scrimshanders depict everything from delicate flowers to portraits of their families. Draw out your design with pencil on paper before you cut into your ivory. Decide what kind of drawing you will make---a ship, a whale, a portrait---and sketch it out. Mark where you will have thick and thin lines, and which areas you will want to shade with the India ink. 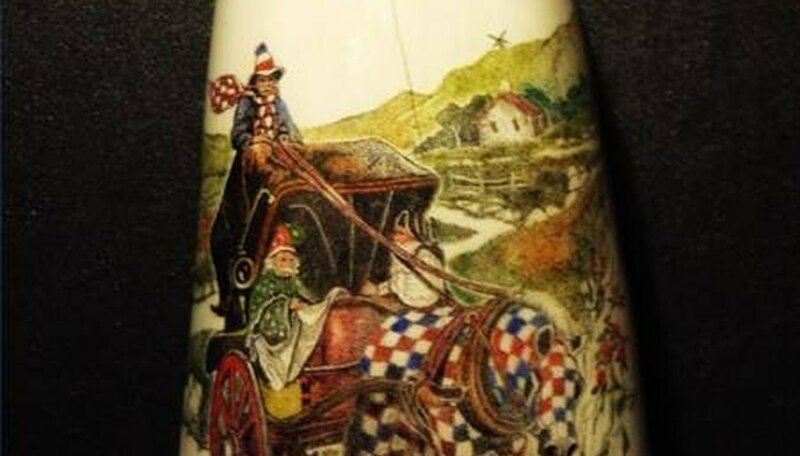 Visit websites with pictures of antique or modern scrimshaw to get ideas (see Resources). 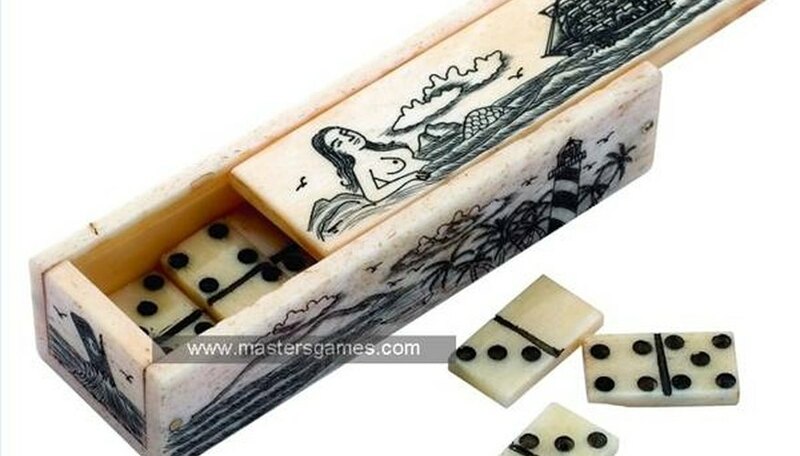 Draw the design onto the ivory with a pencil. Use the fine-tipped knife to draw or scribe your design onto the ivory. Work slowly and carefully. If you are working with a large piece of ivory, you can place it in a clamp to hold it steady as you work. Scrape away the ivory from the areas where you want patches of dark color. It is as important to scribe areas carefully and evenly as it is to create the outlines of the design. Dip a cotton swab in the india ink. You don't need a lot of ink---just enough to come halfway up the cotton padding on the end of the swab. Dab the cotton swab onto all of the areas you've scribed on the ivory, covering it fairly heavily. Let the ink dry completely. Rub the ink-covered scrimshaw with the lint-free cotton cloth, starting at the middle of the design. Rub the ink deep into the scribed areas and off the uncarved ivory. Rub until no more ink is coming off the scrimshaw. If the design looks pale, apply more ink as described above and let dry before repeating the rubbing-off process. You can also experiment with using different colors of ink: apply one color at a time and allow to dry before putting on the next color. Practicing makes for finer, more evenly carved scrimshaw. Buy ivory only from trusted sources to make sure that you are not buying ivory taken illegally from elephants or other animals.